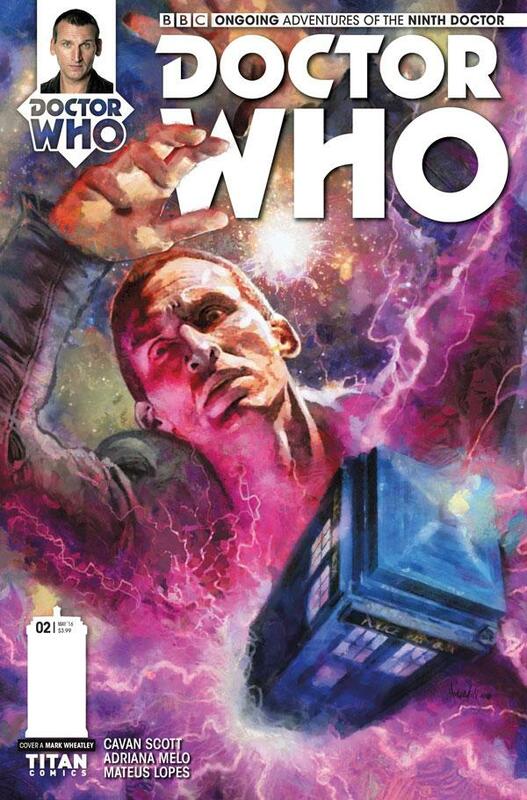 Titan Comics: Doctor Who - THE NINTH DOCTOR #2 Review | Warped Factor - Words in the Key of Geek. Talk about not messing around. 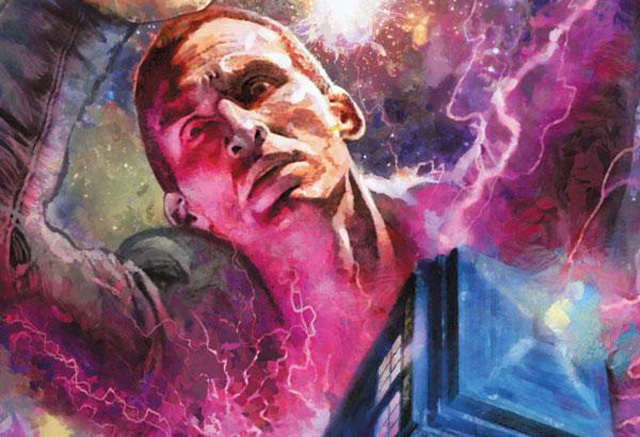 Issue #2 of Cavan Scott’s new Ninth Doctor series with Titan Comics explodes right from Page 1, with a genuinely breathtaking cliff-hanger pick-up image by Adriana Melo. The threat in this first three issues is a distinctly Ninth Doctor villain, and it’s fair to say they’ve never looked better than they do here, Melo shaving off some of the clunkier edges of their on-screen rendering to give us a first page that connects dots in the brain and finally, after ten years, makes you think ‘Ohhh – that’s why they were supposed to be scary!’ It works. It works really well. Melo and colourist Matheus Lopes, who both did extremely solid work in issue #1, delivering the predatory edge of ultra-fandom and plenty of head-nods to Doctor Who history, finds more of their stride and freedom now the villain has been revealed. There are a solid handful of the same species in this issue, and they’re differentiated well, giving a new level of complexity to the species. That’s only fitting, because Cavan Scott takes the opportunity of working with this particular villain and turns up the dial till the knob comes off in his hand – backstory by the bucketload is delivered here, along with a full planetary system, a socio-economic study of the worlds it contains, and a plot not dissimilar to that of The One Doctor from Big Finish, only with a gorgeous fresh twist that, despite the unlikelihood of these villains ever being used in a post-Twelfth Doctor show, had that kind of grand movielike vibe. Scott invents joyfully, building on a foundation set down by Russell T Davies, and it feels like we’ve genuinely learned something that fits, something that chimes with what we already knew but takes us very much further forward, the needs of a new story pushing us way beyond the boundaries established for these villains by the needs of previous stories. Not only do we learn a lot more here about how they came to be and where they’re from, but as with every solid second shot, they’ve learned a bagfull of new tricks this time round, which actually makes them a significantly more serious threat than they ever seemed on screen. If you like your comic-books with a solid moral, go spend your money on this one – while the first issue held up a mirror to the dark side of fandom, human decency jettisoned for a touch of the geeky hem, this issue evolves that message into something of broader relevance in our world, and the message would seem to be ‘Beware your saviours.’ Anyone who claims to have all the answers is probably just wearing the face they think you want to see, and anyone who actually might have the solutions you need will probably shun the human tendency to make our own messiahs so we can abrogate personal responsibility for ourselves and each other. In a way, with two Ninth Doctors running around the place, there’s a simpler message too – judge people only by their actions, not by what they say, or who you think they are. Our Ninth Doctor is positively reclusive in this issue, wanting the popularity of ‘Doctor Who?’ to go ‘the way of Jedward and wearable salad’ at the first available opportunity, and hares off in pursuit of his doppelganger, who, naturally enough, has kidnapped Rose and skedaddled across the galaxy to make the most of the business opportunities that are open to the Ninth Doctor. Scott pushes his pace here, closing down the initial scenario as quickly as feels natural, while feeding a lot of new information in as story development, but takes the time to give all the Tardis travellers at least their moment in the sun – Jack stages a prison break (natch! ), and Rose, having been skedaddled against her will, and even under the threat of imminent gooey explosion, stays true to the spirit of the young girl who saved the Northern Doctor from the clutches of the Autons and earned her place in time and space, throwing more than a hyperspanner in the works of the villainy, and potentially facing the consequences of her rash but undeniably heroic actions. What you end up with in Doctormania #2 is a comic-book that builds on both the first issue and a villainous heritage that goes back ten years, but builds on it with freshness, pace and a tone that feels true to the Ninth Doctor’s single on-screen series, the fluidity of action sometimes boosted by the Doctor’s eruptions of sublimated fury whenever Rose is in danger, his Time War guilt channelled into the rough, raw-edged remembrance of how to be the ‘good man’ he always used to be. It’s got an evolved, useful moral in a world where politicians are keen to peddle ‘simple’ solutions that outrage the compassion, and succeed by doing so, and it’s got art and colourwork that adds depth and dimension to a villain that, on-screen, was always an interesting idea but regularly failed to entirely live up to their potential. In particular, after the explosive first page, check out the final page for Melo and Lopes in especially effective harmony, Lopes making colour-choices that enliven the action and bring home the surreal science-fiction elements of the story, while showing Rose the extent to which her heroics may have backfired. Bottom line, this is a blow-your-hair-back issue of a punch-the-air series. Go get your second dose of Doctormania today, and start ticking off the days to issue #3.